One need only catch a glimpse of a political ad for the current presidential campaign to get a taste of vitriol. Change the channel and you might hear a reality TV show contestant viciously gossiping about a cast mate. Have we always been this snarky and cruel to each other? Have we always been taken in by this type of entertainment? Watching, rubberneckers at the scene. Or, rather, has there been an insidious decline in our treatment of each other? Surrounded by meanness, we take it all in. We become part of it. Suddenly, a snide comment at work sounds normal. Aggressive driving is commonplace. An adult bullies a child at the playground and those overhearing barely flinch. All the while, the kids are watching. And, I can’t help thinking, what are we teaching them? How will they treat each other? 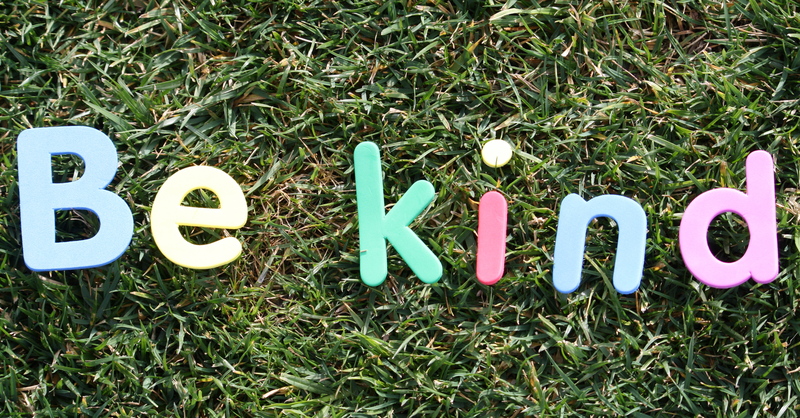 There is a relatively small body of literature on the impact of kindness. We do know that, in adults, performing kind acts increases subjective life satisfaction. Acts of kindness even appear to mitigate symptoms of depression. In children, early maternal support and kindness has now been shown to correlate with physical changes in parts of the brain controlling emotion and adaptive stress response. And there is sufficient evidence that bullying leads to both physical and mental health problems that it has been termed an “international public health issue”. Yesterday I read, with sadness, the New Yorker’s account of Tyler Clementi’s suicide. A tragedy that seems to have, at its core, a profound lack of kindness. A dearth of respect. There are many more stories like Tyler’s. Kids who, for one reason or another, are made to feel that something about them is strange, different, or wrong. It is in these kids that we see the end result of our loss of common decency. So, I’m campaigning for kindness. In my own heart, with my own family, in my work, and with my friends. It is small thing, and perhaps idealistic, but I cannot help but hope it will make a difference. I will avoid put-downs or humor at someone else’s expense. I will treat my family with respect. I will vote with my remote. Television that “entertains” by making fun will not get playtime in our house. Smart, playful humor will. I will say I’m sorry when I am wrong. I will practice patience in an impatient world. I will do this for my son. I hope, in time, he will learn that it is okay to respectfully disagree. But, that it is never okay to be cruel in order to win an argument. I hope he will learn to honestly defend his position, when necessary, or gracefully admit when he’s wrong. I hope that he will know that it is not necessary to make someone else weaker in order to be strong ourselves. I hope he will laugh with his friends and not at them. I hope the world will be kind to him. But, I also hope he will be strong enough to bounce back or shrug it off when it is not. I hope that he will tell someone when things are hard. I hope these things for my son. I wish them for all children, some of whom have seen little kindness in their short lives. I’m campaigning for kindness. Join me. This entry was posted in Health, Parenting and tagged bullying, family, kindness, New Yorker, Tyler Clementi by My Two Hats. Bookmark the permalink. Great post! I join you!